Piech, right, and Winterkorn, left. "exchanged views" about the diesel probe in the U.S., according to a German newspaper report. 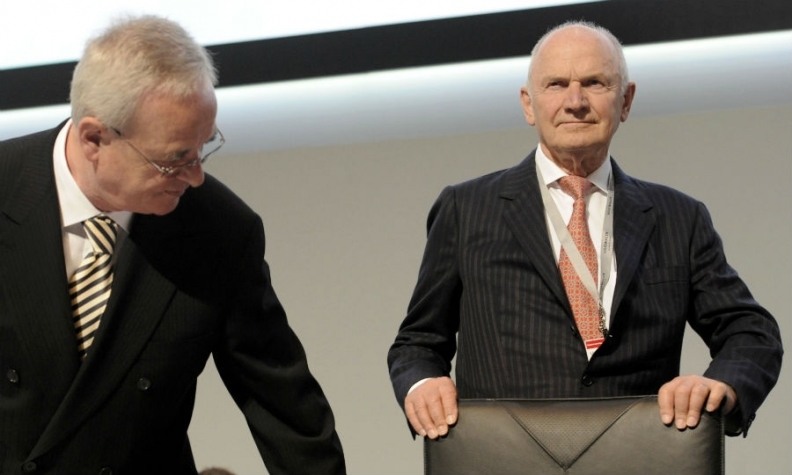 Former Volkswagen Group Chairman Ferdinand Piech tried unsuccessfully to query ex-CEO Martin Winterkorn about the emissions scandal a month before the two had a public falling out, a German newspaper reported. Piech has told U.S. law firm Jones Day, which is conducting the automaker’s internal probe, that he attempted to question Winterkorn in March, 2015 about the U.S. Environmental Protection Agency’s investigation into the carmaker’s emissions, the mass-market Bild am Sonntag said. At the meeting following the Geneva auto show, Winterkorn rebuffed Piech’s questioning, responding that he had it all under control, according to Bild. The revelations possibly shed new light on how the scandal unfolded and help explain why Piech broke with his protege in April of 2015, publicly challenging Winterkorn’s authority and dismissing him as a possible successor as chairman. The feud came without warning and surprised many because the automaker at the time was posting record profit and closing in on Toyota Motor Corp.’s position as the world’s biggest automaker. Piech lost the battle, resigning from his post after a two-week power struggle with Winterkorn. U.S. authorities ultimately went public with their investigation in September, forcing VW to admit to the cheating and leading to Winterkorn’s own toppling just days before he was set to receive a contract extension. Piech never explained the reasons for their conflict other than to say he had lost confidence in his CEO over the automaker’s U.S. strategy and its failure to build a budget car. The former chairman hasn’t spoken about the scandal. Documents released by VW since the scandal broke indicate Winterkorn missed warning signs preceding the biggest scandal in the carmaker’s history, having received two memos informing him of discrepancies in U.S. diesel emissions in 2014 and participated in a meeting that touched on the matter last summer. Piech and Winterkorn "exchanged views" about the diesel probe in the U.S. in the spring of 2015, without addressing the software that VW used to manipulate emissions controls, Bild reported, citing unidentified people close to the carmaker. VW spokesman Eric Felber declined to comment on the report when contacted by Bloomberg. The automaker is waiting for the final results of the internal probe, which may come in the fourth quarter, he said. Supervisory board members have said they only found out about the cheating when the matter was made public last September. VW has already agreed to pay $16.5 billion to resolve U.S. lawsuits resulting from the scandal, with more costs likely to come. While the automaker has settled with car owners and regulators in the U.S., VW still faces investor claims and possible criminal charges. VW also doesn’t have an approved fix for the 562,000 rigged diesel vehicles still polluting U.S. roads.